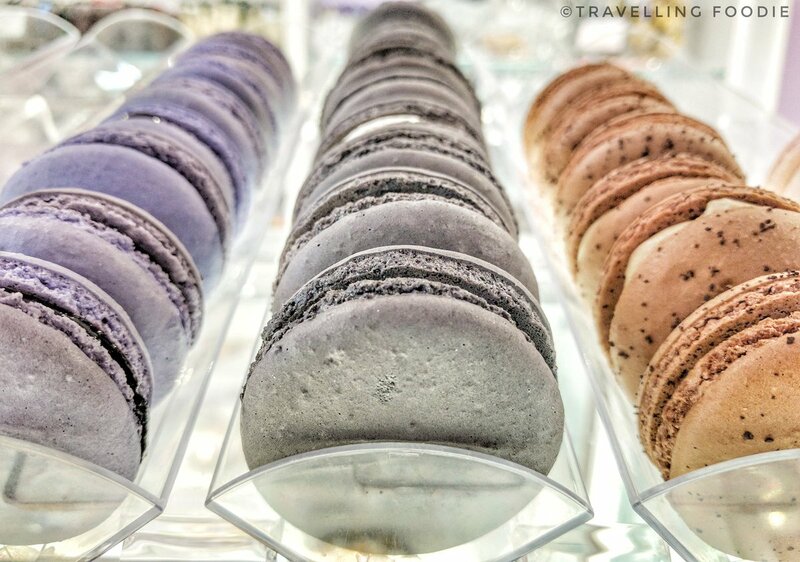 MoRoCo Chocolat is a dessert lover’s playground to satisfy all your sweet tooth! They have recently moved out of Yorkville and into a new shop at Dupont in the Annex, offering superior hand-made chocolates and confections. The shop is very brightly lit with white and lavender colors. There is one counter for ice cream, and another for cakes, macarons, tarts and truffles. 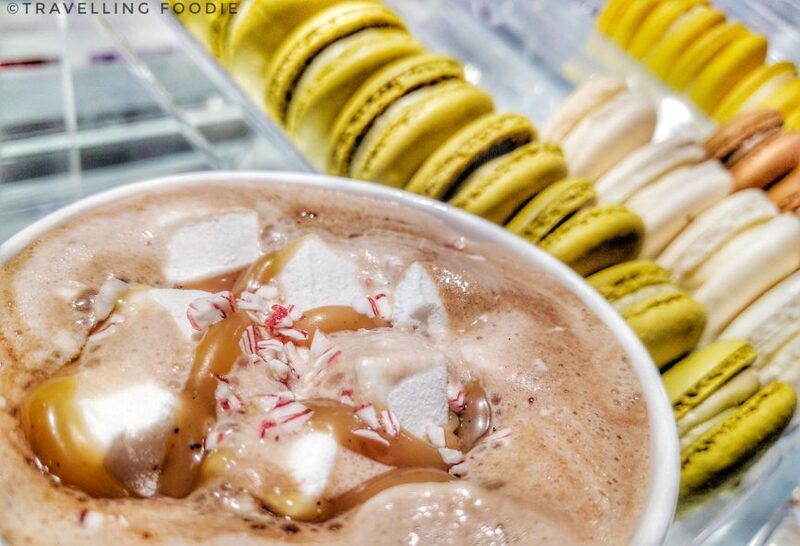 Behind the counter, you’ll spot the hot chocolate machine. There’s a table in the center with only two chairs, so seating is very limited. I had the pleasure of joining an intimate media tasting on December 2, 2016 thanks to @JoannaSable and @Hungry.Jo. – Hot Chocolate Bicharin – this 100% pure hot chocolate is hot, thick, rich and velvety. You can choose between milk or dark chocolate, and add a variety of toppings like marshmallows, crushed candy, syrup, etc. You can drink it raw or with milk. I tried both raw and with milk. If you’re a chocolate lover, you would fall in love with the raw hot chocolate. – Death in Venice Gelato – I’ve heard so much about Death In Venice Gelato so was glad they serve it here. I tried samples of Sweet Corn, Nutella, Bourbon & Smoked Chocolate, and Strawberry, Thai Basil & Juniper. I think what impressed me the most was the Sweet Corn as it really tasted exactly like sweet corn and even had chunks of corn. – Macarons – I really love their macarons as the macaron was chewy in texture as how I like my macarons and the buttercream filling was so flavourful and buttery without being overly sweet. – McQueen Cake – I didn’t really know what I was getting into with this cake. But it was amazing: dark chocolate truffle cake with peanut butter mousse and signature golden chocolate skull! Travelling Foodie Trivia: The cake is called McQueen as it’s inspired by Alexander McQueen, the British Fashion Designer, in which the golden chocolate skull is based out of. – Lemon Meringue Tart – If you’re not feeling for a sweet dessert, this is the perfect one for you. It has a strong tangy lemon taste but not overly sour, and the tart is delicious in all crumbliness. – Chocolate Truffles – I tried their Sub’Lime (white chocolate with Vodka infused lime ganache), Baby Babylon (40% milk chocolate with a crunchy pistachio filling) and Izzat (82% dark chocolate with armocatic green cardamom traditionally found in Badouin coffee, infused in chocolate ganache). Out of the three, I loved Baby Babylon the best because of the strong pistachio flavour! One thing that was so special in this event was we got to learn how to make macaron, at least the piping and filling part, and actually get to build it ourselves to take home! Disclaimer: Although the food was complimentary provided by MoRoCo Chocolat, the opinions expressed here represent my own and not those of the companies. Posted on December 14, 2016 by Travelling FoodiePosted in Canada, Food, Ontario, TorontoTagged restaurants. Looks very yummy, especially the Hot Chocolate! Yess!! The Hot Chocolate was amazing! Glad I got to try both types (raw and with milk) so I can really see the difference!